Lot number tracking and traceability are the important components of the inventory management process for the food manufacturers. QR Inventory makes it easy to track lot numbers of ingredients and final product batches and comply with traceability requirements. Using mobile devices, QR code scanning and mobile forms for data collection, you can track lot numbers of ingredients that went into the final product, collect required data on the production process, track packing and shipping to the customer on the shop floor in real time. In case of the problem or recall, you have all information at your fingertips to find all affected batches and where they were distributed. Lot number tracking requires a lot of paperwork, which is hard to manage when done manually. QR Inventory automates lot number tracking for you, and eliminates all physical paperwork. You track lot numbers of components and final products, as well as final products distribution (traceability) on the shop using mobile devices for barcode scanning and data entry. Your employees use mobile devices to enter each new batch into the system on site, and track each batch through the production process. The time spend on tracking and keeping records is minimal: scan QR code or barcode on the ingredients one by one, add any additional observations / notes if applicable and submit transaction. Adjusting of inventory stock is done automatically, and records of all transactions are saved in the centralized cloud database. Administrators can access submitted records on demand and search by multiple parameters to quickly find all information required for traceability. This includes all final product batches that contain specific ingredient, where these batches were distributed, conditions during specific batch manufacturing, etc. QR Inventory makes it easy to assemble final product from the raw materials and record the process, tracking ingredients lot numbers for every batch of the final product. You can create a generic list of ingredients for all finished products, then apply this list to each new product batch without a need to re-enter. While creating a batch, scan lot number of the actual used ingredients against the list - and everything is recorded and saved. Alternatively, you can record creating of the product batches without using a list, by scanning used ingredients and entering quantities. Mix and match both methods to accommodate your workflow and production process. All tracking and recording is done on the shop floor in real time using mobile devices. Employees can use their own devices (smartphones or tablets), or you can use company issued devices if you prefer. 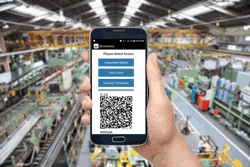 For barcode / QR code scanning you can use smartphone camera, which will work well in absolute majority of cases and will save you money on purchasing inventory scanning hardware. If you need to process large transactions fast, you can use a hand-held barcode scanner attached to the smartphone or tablet. QR Inventory is natively integrated with Socket Mobile line of barcode scanners. Native integration allows you to process inventory transactions very fast, by scanning one item after another without interruption, extra clicking or navigation. In addition to recording inventory transactions, you can collect any other data on the production process that you need to keep and report. These data may include serial numbers of containers, instruments and equipment used, recording observations and conditions during the process, etc. You define what data to collect via the web dashboard, and your employees will be able to record information on the mobile devices when processing a transaction. All collected records are instantly sent to a central database and can be accessed on demand by all authorized employees, on the computer in the office and on the mobile device on the shop floor. Once product batch is created, you can easily split it into units (lbs, liters, trays, packages, etc.) for shipping to the customers or further use in production. QR Inventory will automatically pro-rate ingredient's quantities for each unit, preserving all collected lot number information. Once the split is done, you can use the product batch in the other products, or ship to the different customers. As with other inventory transactions done in QR Inventory, you define what additional data to collect when you record shipping transactions. These may include tracking numbers, delivery date, notes, etc. You can use recorded data to quickly sort through shipping transactions and find the ones you need. In case of a reported problem with an ingredient, find all product batch(es) containing an ingredient with the specified lot number. In case of a reported problem with a final product, find lot numbers of ingredients used in the specified batch, what other product batches have these ingredients. Find everything about affected batches distribution: where they were distributed, when, how many units, how many you may still have in stock and where. Review recorded details for ingredients and final product batches. Use multiple search filters to find required transactions fast. Use mobile data collection module (also known as QR Mobile Data) to create custom mobile forms for recording food safety inspections on the shop floor. Inspections records are stored in a secure cloud, are accessible on demand at any time and are easily searchable. You can review records online, download records and create custom formatted pdf reports for external auditors in one click. Check out more information on mobile inspections for the food processors.